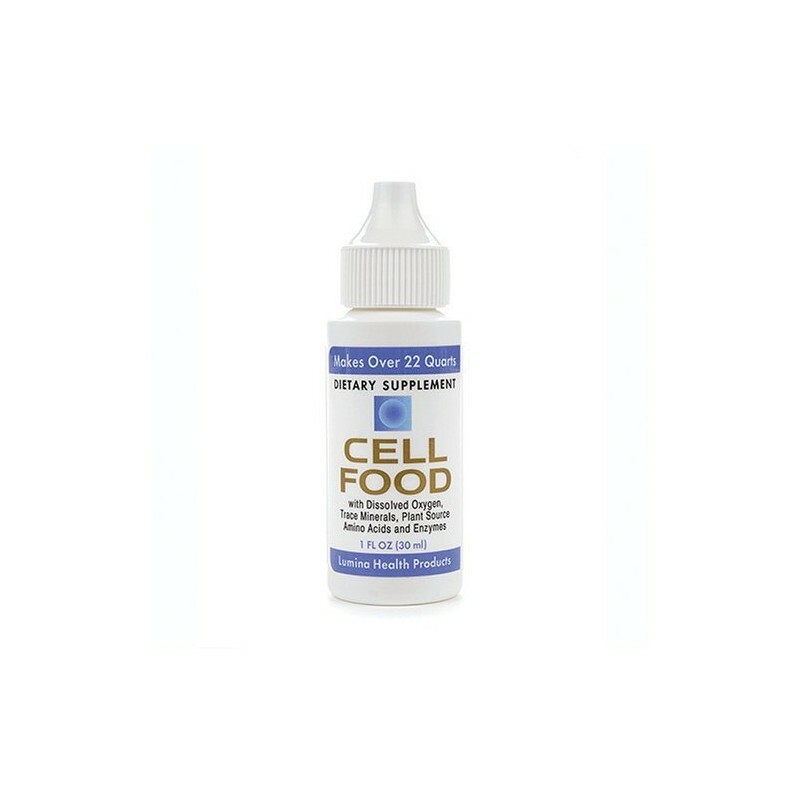 CELLFOOD is a proprietary ionic formula that contains 78 ionic minerals, 34 enzymes, 17 amino acids, electrolytes and dissolved oxygen-and utilises a unique water-splitting technology. It provides an unsurpassed oxygen and nutrient delivery system, and is absorbed quickly and efficiently by every cell in the body. Cellfood's unique structure oxygenates and feeds the cells-cleaning and tuning up the body's systems throughout the day. Cellfood is made from all-natural plant substances, and is yeast-free and gluten-free. It was said by a well-known doctor that there is really only one disease known to mankind- though it has a thousand names. It's the disease of too many toxins in the body and too few nutrients reaching the cells. Cellfood is the only product that addresses these two vital health issues at the same time, and with remarkable thoroughness. Cellfood is created by a proprietary nine month process in which these all natural nutrient-rich plant substances are held in a negatively-charged suspension of deuterium (an isotope of hydrogen). The result is a remarkable formulation which- by utilizing the same technology used decades ago to split the atom- actually 'dissociates' (splits) water molecules within the body by weakening the bonding electrons, and gives birth to cascades of vital, life-giving oxygen. This newly-born oxygen, combined with an array of vital nutrients, is carried to every cell in the body- cleaning, toning and building the cells and tissues hour after hour, day after day. Since our bodies are over two-thirds water, this oxygen and hydrogen source is virtually unlimited. When you mix Cellfood with water or juice and ingest it, its proprietary water-splitting action begins the moment you take the first sip. This cascading time release of oxygen typically peaks within 8-12 hours, and then keeps working hour after hour. In partnership with the body's own natural intelligence, Cellfood releases oxygen whenever and wherever it's needed- and if no longer needed, no more is released. And, its essential natural minerals, enzymes, amino acids and electrolytes are delivered simultaneously throughout the body on the deepest cellular level. Cellfood is a miracle of electromagnetic design. Since Cellfood is colloidal and negatively charged- just like the blood and lymph fluid- there is a natural synchronicity between these fluids. Cellfood and its nutrients move through the cell walls easily, and its vital nutrients are absorbed and assimilated quickly and efficiently. And, Cellfood is a di-pole, di-base delivery system, delivering its nutrients to the cells and tissues under any conditions. (Di-pole means Cellfood is effective in any polarity range of the body; di-base means it's effective in any pH range and will tend to normalize the body's acid/base balance). Therefore, Cellfood is exceptional as an overall delivery system not only for its own nutrients, but for increasing cell-absorption (by as much as 3-5 times) of any other nutrients or substances introduced into the body within the same 24 hour period. Notably, there is no known toxicity associated with Cellfood. Importantly, Cellfood won't create free radical damage. Free radicals - believed to be a primary cause of aging and disease-are positively charged ions of oxygen. 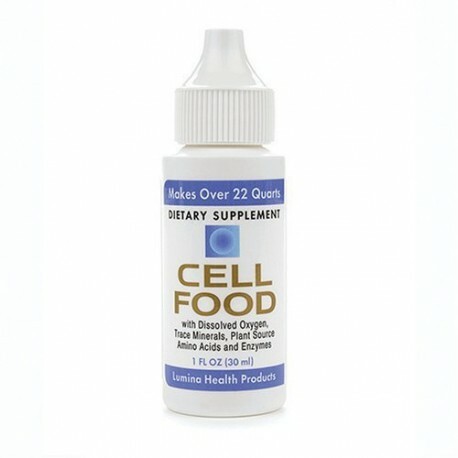 Since Cellfood's released oxygen molecules are negatively charged, they seek out and attract these dangerous free radicals, joining with them to form stabilized oxygen. Adults take 8 drops in 240 mL of purified or distilled water, or juice, 3 times per day-or during stress or physical activity. Best taken between meals (at least 15 min. before or 1 hour after). May mix 1 day's amount in waterbottle and sip throughout day. Each 30 mL bottle of Cellfood contains 90 servings of 8 drops each, or 720 drops. Some users may experience a cleansing or detoxification response. If so, halve dosage at beginning, then gradually resume full dosage. Use Cellfood carefully over any surfaces and materials when undiluted, as product contains organic enzymes. Avoid eye contact; rinse with water if dropped in eyes. Where else can I use Cellfood Original Concentrate? 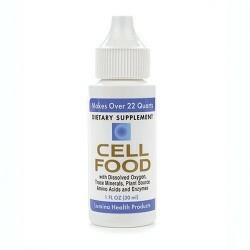 Cellfood has been formulated in a special gel base for external topical use- Cellfood Oxygen Gel. Made from Cellfood original liquid concentrate, aloe vera, chamomile, glycerine and fossilized organics.